Imagine, if you can, that corporations truly are like people. They would vary in their dispositions. Some would be selfish and short-sighted, caring only about their own immediate gain. Others would be more prosocial and far-sighted, genuinely caring about the world around them and willing to do their part to promote the common good. As with real people, the cooperators would be in danger of exploitation by the knaves, but they would also be able to protect themselves by banding together, establishing norms of proper conduct and punishing transgressors. That’s how individual cooperators manage to survive and even thrive in a Darwinian world. Why shouldn’t the same be true in a world of corporate people? One person who is able to imagine this scenario is Per L. Saxegaard, a former Norwegian investment banker who decided to create the equivalent of a Nobel Prize to recognize enlightened business leaders. He does this through the Business for Peace Foundation, which was founded in 2007. The prizes are awarded annually at the Oslo City Hall, the same location for the award of the Nobel Peace Prize. Thanks to my friend and colleague Atle Midttun, a professor at the BI Norwegian Business School, I was honored to attend the 2018 Summit that is held in association with the award and to give a breakfast seminar on Multilevel Selection (MLS) Theory in relation to business. Atle is a key member of the Evolution Institute’s Norway Project and appreciates how MLS theory can provide a more nuanced understanding of cooperation and competition than orthodox economic theory. The seminar can be viewed online or via the video below, including comments by a 2017 recipient of the Business for Peace Award, Harley Seyedin and two other distinguished commentators. When I briefly met Per during the busy day, he told me that he was an Evonomics reader! It was a perfect opportunity to invite him to have a conversation to explore how his efforts to humanize corporations can be understood from a multilevel evolutionary perspective. DSW: Greetings Per, and thanks for taking the time for this interview! PS: That’s just a pleasure, David! DSW: Please tell us a bit about your life leading up to your decision to create the Business for Peace Foundation. Bear in mind that while you are already well known in some quarters, you will be newly introducing yourself to many of our readers. PS: Sure. I was born and raised in Oslo Norway in a liberal conservative family with a twin-sister and an older brother. Now I am a father of three girls from my first marriage. From early on, I think I had an opportunity-driven mindset, getting pleasure from having ideas and seeing them turn into action. I guess I was quite an active student outside the mandatory school subjects, engaging and organizing various initiatives and events. Curious about the world and how it works, I concluded my MBA studies in the mid -80s by travelling around the world. Being entrepreneurial in my business mindset, I started my first small business during school days. Focused on implications of technology, I wrote my MBA thesis on electronic information and data markets and helped organize the first Norwegian investor conference on the commercial internet. Professionally I have primarily been working with strategy, business development and investment banking services. I co-founded and ran a mergers and acquisitions focused investment bank for many years. DSW: Thanks very much! Now, what moved you to create the Business for Peace Foundation? PS: Several reasons, I guess. But maybe key was reflections I made of the relationship between money and happiness coming out of my divorce. My views on the transformative implications of technology in society and what that would mean to value creation and leadership in business surely added to this. After World War II, business schools blossomed all over the United States. All the major universities set up business schools. Before that, businessmen were just businessmen. They didn’t go to college, or if they did they didn’t learn anything about business. But these new business schools were very professional. When they wanted to teach economics, they simply borrowed from the economics discipline. In economics it’s called Homo economicus. Homo economicus is not that popular any more but it certainly was after World War II. Homo economicus has no emotions. He’s totally interested in maximizing his wealth and income. He really doesn’t care about other people, although he does care about leisure. Leisure, income, and wealth are the only things. When they taught this to business school students it obviously followed that if you’re a good businessman you should just maximize your material wealth. This is greedy. Being greedy is human, it’s good to do, and the more greedy you are the more successful you’ll be. This passage identifies orthodox economics theory, communicated through business schools, as the main culprit behind the “Greed is Good” ethos in the business world. Do you agree with this assessment? If not, then what is your own account? PS: I do know the Homo economicus concept. I have probably both lived and experienced it, though I didn’t have a clear name for it at the time. Coming out of business school in the 80’s, many of us were quite focused on making money, feeling it was a key measurement of success. I guess I believed that the more money I made, the happier I would become. I was lucky enough to have some good success and made some money. But I also developed a degree of monetary “tunnel vision” along the way. I believe this reduced the quality of some of my personal relationships and contributed to a breakdown of my marriage. It got me reflecting more deeply on the meaning of money and its value in my life. I realized I was on a wrong track. I learned that after growing to reach a certain level of income or wealth (a surprisingly low level, I understand some research indicates), the “marginal happiness or wellbeing” of making more money may have a negative growth rate and eventually can turn out negative, expressing a negative sloped curve (see illustration). So, you might say that being overly focused on making more and more money is not necessarily such a smart deal. Work can be so much more than money. It might represent a higher meaning, give identity, community, a sense of belonging. I believe these values add to another curve, going the other way, a positive shaped curve (see illustration). This curve is reflecting the effect on your wellbeing of making a difference to other people. 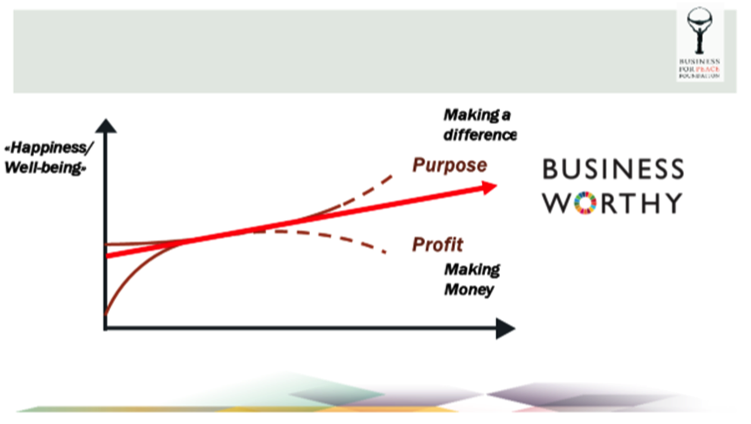 So, it struck me that what we need to focus on in business is to get these two curves, the “making money” curve and the “making a difference” curve, to come together. We need to make money while making a difference to other people; merging profit with a higher purpose, while acting ethically and responsible. We coined it to be businessworthy. All business people know the concept of being creditworthy. That’s about not losing other people’s money. Being businessworthy is about earning other people’s trust. You can’t buy trust. Others give it to you. I believe the concept resonates well with a fundamental entrepreneurial drive; the pleasure in solving problems and finding new, better solutions. The concept conveys a simple, but key insight in turning this core drive of business people into a bigger goal than just making money. Money can motivate, but no amount can inspire. Inspiration reflects something greater. It comes from within and is unleashed by a big idea or big ideal, bigger than money alone can contribute. Business people should be inspired to make a difference, serving a bigger purpose, while also needing to make a profit. Seeing the potential of the businessworthy approach and the impact that it might have in changing the perception of success in business and the role of business in society, the Foundation was created. The mission is to inspire the higher purpose business with the vision that all business leaders have as their purpose to improve society. The Business for Peace Award, given to outstanding businessworthy individuals by Nobel Laureates in Peace and Economics was established to create the highest possible incentive to help accelerate this. Candidates are nominated in a bottom-up process by four global organizations; ICC, International Chamber of commerce; UNGC, United Nations Global Compact; UNDP, United Nations Development Program and PRI, Principles of Responsible Investment. Some in the media has referred to it as the “Nobel Prize in business”. DSW: I have learned enough about the Norwegian business world through Atle and his associates to know that it is very different from America and the UK, although perhaps more similar to other European nations. For example, Norwegians would not tolerate a 300-fold income disparity between the CEO of a company and the average employee. Is it true that Norwegians have been less influenced by the “Greed is Good” ethos than elsewhere? PS: To a certain degree, probably yes. Though there are many examples on the opposite, we are quite an egalitarian society with many values promoting equality. I think these values contribute to an important level of trust, which again adds to other cherished Norwegian values, like being innovative and willingness to take risk. DSW: One reason that orthodox economics has such authority is because it appears to rest upon a solid theoretical foundation. Readers of evonomics.com know that this foundation is an illusion. Nevertheless, it is important for your concept of “businessworthy” to itself rest upon a strong theoretical foundation. What do you or your associates tell a skeptic who challenges you to prove that being businessworthy is a sound business practice? PS: Empirically proving might be for future research to conclude. It will depend on perspectives and definitions applied as well as relevant time chosen. But we can show the way through the examples of our Honourees, acting as role models. To develop a sound business practice, you must be able to create value for your customers and at least capture enough of that value to survive. This usually means taking risk and having your skin in the game. I think the businessworthy concept recognizes this as a fundamental starting point, but adds that to successfully sustain a business, you will increasingly need to have your soul in the game as well. This means developing a more conscious, broader and more human mindset. I think being businessworthy, understood as ethically and responsibly seeking to solve problems that create value for both business and society, resonates on three levels simultaneously. On an individual level, the higher purpose dimension helps being a business person become more meaningful. Purpose nourishes meaning. It promotes a more human-centric culture and helps the identity of being a business person evolve into something greater than money alone can convey. The work you do may mean so much more than the pay it gets you. Not all profits are created equal. I believe the concept has the potential to help redefine what it means to be a successful business person. On a business level, the concept helps bring together the inspiration and meaning needed to attract talents and a strong approach to navigate in the rapidly growing complexity and interdependence of the new market reality. “Purpose is the language of the millennial generation”, the saying goes. Young talents seek both meaning and money, and will rather work for the benefit of billions of people than for the benefit of billionaires. Important technological developments in Big Data and Artificial Intelligence are increasingly helping to document and measure how the world really works, and are making markets become more data rich and thick. This new market reality challenges business positioning and demands deeper and broader insight than the condensed and simplified information money can convey. As we have only one earth, our only abundance is informational. The challenge is how clever we can be in exploiting the informational surplus to the benefit of all. Data will make markets become vastly more efficient and sustainable, and empower humans to work better together. Firms will need to be extremely data savvy, but technology is always easy copied. I believe key competitive differentiators will be human dimensions and culture. It’s a twist of irony of technological progress. The new reality demands a broader mindset than what traditional financial thinking entails. We can clearly see the changes in business thinking spreading around the world, lately leveraged and challenged by climate changes, geopolitics and initiatives like the UN Sustainable Development Goals. The businessworthy concept seek to coin and help accelerate the penetration of this new mindset and action. It seeks to inspire business leaders to broaden their own thinking and transform data into new insight, to better decisions and behavior. The need for a broader mindset in business seems evident. But it will be a multi-marathon. As Eugene Kleiner, a famous engineer and investor once said; “It’s difficult to see the picture if you’re inside the frame”. On a societal level, businessworthy companies, led by the higher purpose of improving society, will want to behave and will seek to solve broader problems than purely economic needs. As technology makes it possible, business will increasingly seek to optimize on broader goals than financial return alone. The businessworthy concept reflects the business mindset and action needed to promote sustainable development, prosperity and peace. There is no necessary natural trade-off between profit and social progress. It rather constitutes the fountainhead of future innovation and competitive differentiation. Societal needs help define new markets. Profits with a higher social purpose can create a positive cycle of prosperity between business and society. It might be self-evident, but business is here to serve society. It cannot survive in vacuum. DSW: All of this is eloquently put! How does the businessworthy concept relate to—and perhaps go beyond—the concept of Corporate Social Responsibility (CSR)? PS: Corporate Social Responsibility as a concept has evolved a lot and has a broader scope now than when it appeared many years ago. Still it’s very much perceived around reputation and responsibility. In my mind, this has some drawbacks, as the perception of such focus easily lose out a crucial key to a business mindset; the inspirational power that lies in creating something of value. This is core to any business risk, strategy and success. Creating value through solving problems; better, cheaper, faster. It’s the bedrock of why business is started and what it’s run to achieve. The businessworthy concept recognizes this as the starting point. It builds on the pleasure and risk in creating, and expands this from focusing on just conventional economic needs to also integrate societal needs. The concept thus combines the importance of acting ethically and responsible with the aim of solving problems that create value for both your business and for society. Another aspect with CSR, as with several similar approaches, is that it usually appears in third person. You can discuss and talk about it, but it’s something which is difficult to be as a person. You cannot be CSR, sustainability or triple bottom line – as a person. But you can be businessworthy. The businessworthy concept reflects a business culture of mindset and action. I believe it could have the potential to inform the identity of being a business person. As a doctor, a teacher, a priest or maybe even a lawyer, you have a certain calling – an identity. But as a business person, should your identity only be perceived as to be making money? I believe many business people think it should be more to that perception. DSW: I’d like to share some of my own thoughts about the panels that I attended during the summit. The people on the stage were talking about how corporations should behave in an interconnected world, but if you imagined them talking about how individuals should behave in a small group setting, everything they said would make perfect sense. Don’t be selfish. Don’t be impulsive. Try to become part of something larger than yourself and seek the company of likeminded people. Establish norms of good behavior and make sure that others uphold them in addition to yourself. Once you truly reject the notion that profit maximization in a free market economy qualifies as a moral system, then the only alternative becomes as clear as a bell—to create a real moral system, with elements that are already familiar to us at the scale of small groups, but expanded to include the whole earth. The construction of a moral system for the whole earth is where corporations as giant people and information technology will play an essential role. This is the essence of the seminar that I gave at the summit and—for me—the essence of your Business for Peace Foundation. PS: That’s an inspiring comment, David. In a transparent, interdependent world, businesses wanting to sustain successfully will increasingly find it both natural and smart to behave ethically and responsibly. With technology now making it easier to optimize for higher purposes than profits alone, business could very well become the essential contributor you suggest. The Foundation is called Business for Peace. It’s not without a reason. The meaning of the word Peace should not be limited to its common understanding as “absence of violence”, often referred to as negative peace. The word has positively sensed meaning too, positive peace. This can be understood as the attitudes, structures and institutions that create and sustain peaceful societies. It’s moving the meaning of peace from reactive to proactive, how we can sustain it. A way to think about it I like, is as the optimal environment for the human potential to flourish. In my mind there is an untapped potential for business to contribute to such an environment, provided business is focused on doing the right thing – provided it’s businessworthy. Adam Smith had some good insights to this. Business people often regard him as the father of capitalism, promoting the “invisible hand” and the perception of the market’s virtuous ability of self-correcting and self-balancing. But as many scholars have pointed out, he has often been misread. He was a moral philosopher. There is a quote of him, relevant to your comment, that I like: “Markets could not flourish without a strong underlying moral culture, animated by empathy and fellow-feeling, by our ability to understand our common bond as human beings and to recognize the needs of others.” Smith recognized that there is a moral realm in human affairs, and that there is more to human life, government, and policy than just economics or pure self-interest. He saw business through the eyes of the individual, fully embedded in the broader society and subject to its moral demands. For him, community and its normative framework and business and the individuals within, need to be aligned with each other and develop together. Having experienced depressions, bubbles, and the recent increasing inequality and collapsing trust, we are learning Adam Smith’s insights the hard way. Helped by modern technology, business and societies around the world are now more interconnected and interdependent than ever before in history. The scaling of his insight to a global level should not be inconceivable. But the road will be bumpy and risky. Large numbers of people are feeling left out of society’s progress, living without hope or faith in the future. We see increasing populism, authoritarianism and geopolitical polarization. These are dangerous historic signs of societies not working, of social contracts breaking up. There is no doubt more questions of importance to business than the purely economic ones. I think we need business for peace. We need a new deal for the digital age that can help restore faith in the future. Business will need to play an important role. We must make sure technological development works for us, not against us. Too many debates over the future and especially on the implications of artificial intelligence, are focused on utopia vs dystopia. We would be well served by focusing on our shared values and how best to integrated them into technology. Ethics and good technological design should go hand in hand. Having gone from being connected to being interconnected, we should move on to being ethically interconnected as well. I believe there is a huge untapped contribution to prosperous and peaceful societies from businesses around the world living and voicing such values and norms, businessworthy norms. Hopefully the Business for Peace Award and its Honourees as role models, will help inspire and accelerate such a development. Because business will have no future in societies that break down. Next PostSex Roles Are Flexible in Chimpanzees and Bonobos. What Does That Say About Human Evolution? In general the discussion expresses a level of true values/ at the same time next to a high degree of illiteracy. First of all there seems to be a speach disorder about cooperation and competion, where competition is explained as being selfish. Actually competion means the difference between levels of efficiency and urgency, which are unpersonal values. It describes how things operate and what their priority is. In economy cooperation is an effect of being complementary to each other/ otherwise there will be money competion between who will survive and and who will not. This can be related to broader affiliations; like government interest; resulting in price controle which is cooperative and selfish at the same time. So cooperation also leads to monopolies which are inefficient for establishing true values which should be in competition which each other. Google, facebook and others alike are on the money level monopolies: capitalist cooperations acting according to anti capitalist principles: there should be competition. So cooperation does not promise a level of wanted values in this case/ although their operation might be very efficient: nobody can verify on what levels with what consequences. The fact a cooperation must offer a value which is wanted by culture before it can be profitable; next to being efficient in its production itself, articulates an age old central economic principle and is far from a new concept. As a type of cooperation. It suggests reinventing the wheel. In general apparently there is a lot of confusion about how social selection would operate/ in contrast to how the economic money principle, which is the only mathematical guidance for economic behavior, in fact does operate. You cannot mix the two up, as if the main (money) principle; which suggests to be physical evidence/ but in fact is not when you study it; did not exist. This is highly unprofessional. When this principle would be studied and properly understood, you would also understand the value of losing other peoples money is false, since they represent a loose connection which in an economic sense is misplaced and irrelevant. It represents a very inefficient misallocation of value. Therefore culture makes no mistake; is not irrational in its behavior; by concluding multi billionaires are an unwanted option for proper cultural functioning. It is not jealousy driving this, but collective (be it instinctive) consciousness of dysfunctionality. This can only be understood when you have become familiar with the sum of energy exchange (which is driven by thermal energy shortages) our money system is funded on.